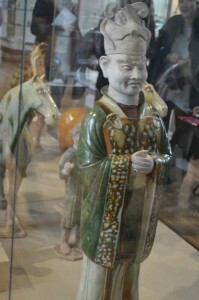 The Tang dynasty – 618AD to 907AD – was one of the golden ages of China. We’re often a bit unspecific about the dates of exhibits in the museum – placing things in a century or even a millennium, but we know that these figures date to 728AD. 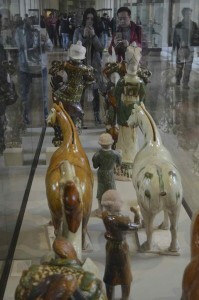 They are tomb figures for a general called Liu Tingxan whose funeral was in that year. This type of tomb figure was widely used among high-status individuals from about 700AD. They’re glazed earthenware in a style known as ‘sancai’, which means three colours: white, green and amber/red (they also did blue and black, but let’s not disappear down that rabbit hole). We know quite a lot about Liu Tingxan because he told us all about himself – in the tomb was his obituary, praising his skills as a general, his wisdom as an administrator and as a politician. Now, this obituary wasn’t for posterity to read, but so that the people in the afterlife knew how important he was. When Liu Tingxan died there wasn’t a concept of ‘heaven’ and ‘hell’, so he wasn’t going to be judged in the hereafter, but he wanted to make sure he was accorded his rightful status. 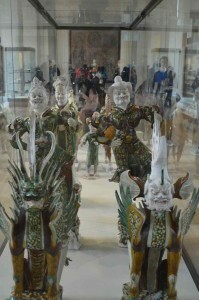 The figures are from the Buddhist tradition. In the front are two fearsome beasts to scare off tomb raiders; next two lokapalas – divine kings – who are also protectors of the tomb. Look how warlike they are, and they’re shown standing on bulls to emphasise their size and strength. Next we have two civil servants, the first a military official, dressed in armour, standing alongside his civil equivalent. Their role was to make the case for Liu Tingxan in the underworld. After that we have horses, camels and their grooms. The horses would have had leather harnesses and trappings, and you can see slots for their mains and tails. This type of horse was a new imported breed, so their inclusion shows the wealth and prestige of the general. The camels were the beasts of burden of China, so they represent goods and trade. Look at the way their heads are rearing up – you can almost hear them roaring. Camels like this worked the Silk Road, the major trade route from the middle east that crossed central asia and which helped make the Tang dynasty rich. For details of my tours of the Treasures of the British Museum, click here. This entry was posted in British Museum, five minute presentations and tagged tang grave figures on 03/03/2016 by donbrown.